Power is a fairly evil thing. No doubt that's a big reason why we multiboxers do what we do. I've been boxing for several months now, and I can't tell you how many times I've launched off 5 simultaneous Chain Lightnings. Yet every dang time I smile. I did complete my lvl 60 gear, and spent some time in Alterac Valley. It was amazing. After struggling to help push the offensive, I decided to try defense for a round. I'll tell you what... Shamans were meant to stand still, next to their totems, and wait for the next unfortunate soul who dared stumble into range. That's what defense is. At least in AV. The Horde base in AV is surrounded by an impassable wall. The only opening is between two towers, and about the width of 5 Tauren shoulder to shoulder. That' quite a bottleneck. That's where I made my stand. There's a hill just before the opening, that the Alliance have to climb. It's small, but it keeps the average user from seeing ahead. Perfect. I fanned out the boys about 20 yards from the bottleneck, dropped my totems, and waited. Everytime a clever mage with giant brass bawls decided it was his turn to rush the base, he found himself promptly plugged directly into the powers of nature. I can only imagine the parts of his body that melted together before his soul gave up and left. It was pure win. Everywhere. This went on and on. 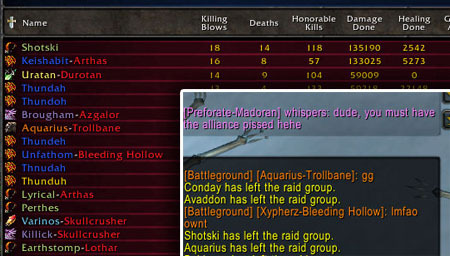 No matter what they did, the Alliance couldn't get past me. They started sending in pets, and I'd kill them before they got to a toon. Mind you, I had a good group of others that were helping me. There's no way 5 Shaman are going to hold back 30+ Alliance. But it was still a sight to see. I couldn't wait any longer. I wanted to see what else I could do. How far I could go. So we ding'd 61, and put PvP on the shelf for a while. I headed into Outlands to clean up the quests I had skipped in Hellfire, because they didn't give me gear I wanted. It was beautiful. The XP was flowing, my power was growing, and with each quest I'd glance over at Hellfire Citadel wondering if I could go inside. 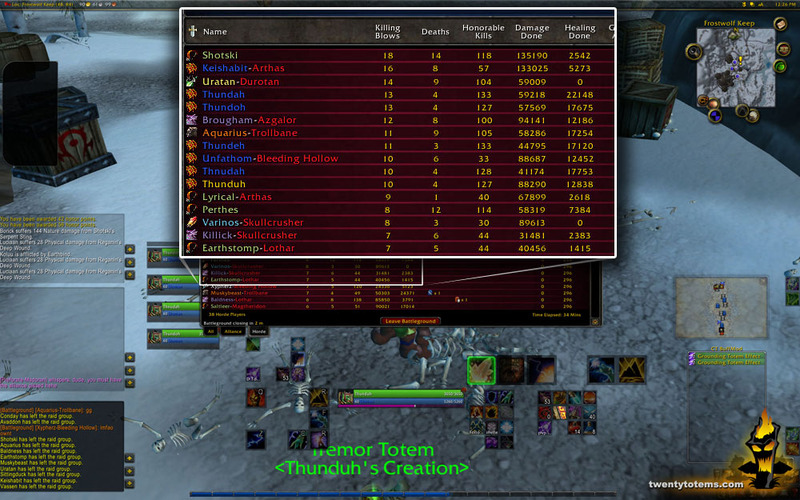 At 62, I took 5 Shaman, no dedicated healer and no tank, into Hellfire Ramparts. I was shocked by what I found.